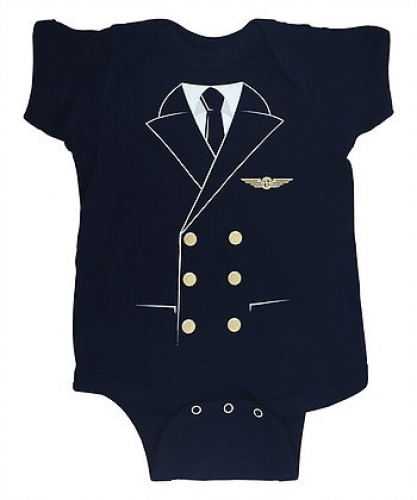 The Pilot Uniform Baby Bodysuit is the official outfit of newborn pilots everywhere! It makes the perfect gift for aviator parents celebrating their most important arrival. Navy blue with gold buttons & wings. Super soft 100% combed ringspun cotton. EasyTear™neck label, reinforced 3-snap closure, expanding lap-shoulder design makes dressing easier. Printed in the USA with the highest quality inks. Individually packaged and gift-ready. Available in 6, 12 & 18 month.